With the exception of this computer, all my other upgrades were disaster upgrades because the then current computer went up in flames taking most everything with it. 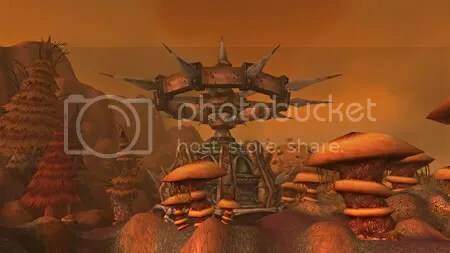 I started playing WoW in November 2006 and the shot above was taken July 4, 2008, so this is my oldest existing screen shot, not really where it all started. 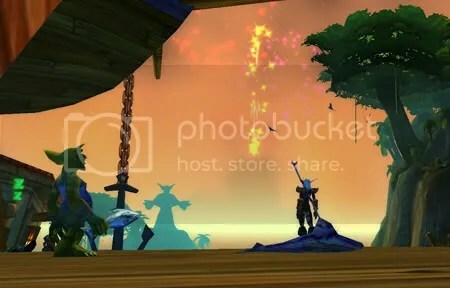 It’s of a young feral Druid enjoying the fireworks in Booty Bay. 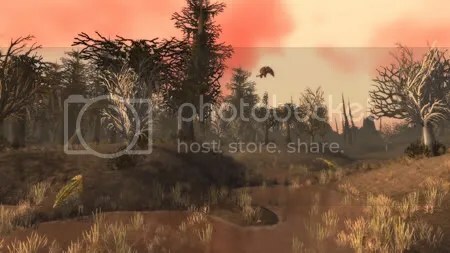 Earlier screen shots would have been my Hunter displaying each new pet. 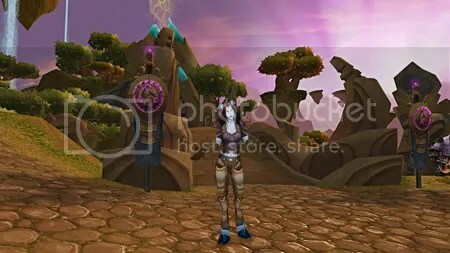 I’m adding a shot of my Enhancement Shaman, it’s from July 22 2008. She’s inquiring as to what is my problem. She’s pretty cheeky though and it’s more likely she said something like, “Vat te Vuk?” She was my second main. She’s still around, she forgave me and still makes jewelry for me. In a way, although for her this was an end, it was also kind of the one that started it all because I was telling her sorry, the Druid’s getting top spot now. Oh and yeah … alone in both. Little Miss Plays Well with Herself. Over the long weekend my husband brought work home from the death camp where he works. It was nice to have company but it limits what you can do in game. If he starts in on a diatribe about his place of employment it’s only polite to turn to him and give him my undivided attention and throw in an occasional, “Hell yeah!” and “Those $%#@ers!” And they really are. But that’s a whole ‘nother story. So I thought about all I could manage without risk to me or others was sightseeing. 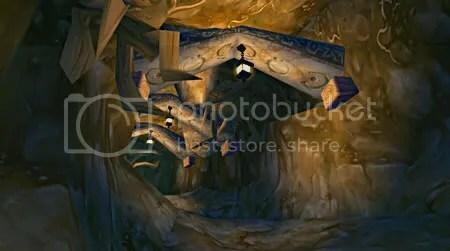 I decided to visit places that had scared the bejesus out of me back when I was starting my WoW career. I thought I’d see if they had the same power to frighten now that I was a big tough level 85. Yeah, that first one doesn’t look all that scary does it. The Ban’ethil Barrow Den. If you were a Night Elf you have to know that one. The inhabitants aren’t particularly intimidating, it’s the fact that I’ve never successfully found my way out of a Barrow … any of them … ever. And yes, after taking the screen shot I had to finally hearth out because I still can’t find my way out of one. 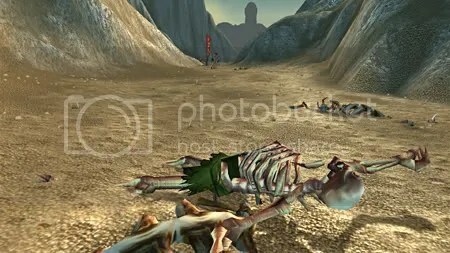 I remember being asked while in Desolace to go to the Valley of Bones and clean up the undead ravager infestation. There was just something creepy about this place. 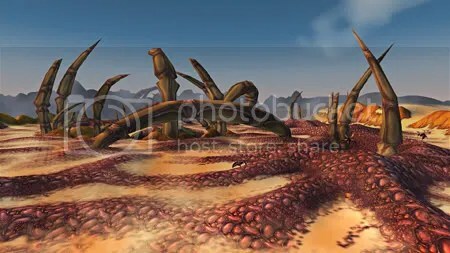 Okay maybe I was just jumpy from spending all that time in Desolace but boy, was I ever happy to leave the Valley of Bones. Oddly I moved on to Mannoroc Coven where the Demons didn’t seem to bother me at all. The Dragonmurk, back before the patch 2.3 overhaul of Dustwallow Marsh. A dreary, lonely place full of whelps and crocolisks, ugh. Not my favorite place. After patch 2.3, later characters enjoyed the zone, but my early characters … not so much. The Noxious Lair. 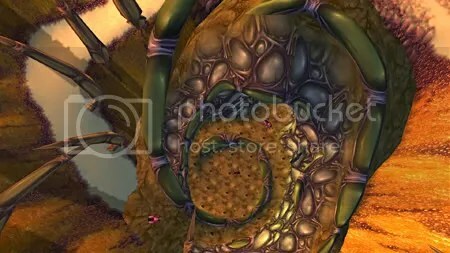 I have always loved Tanaris, but I really have a problem with spidery things. I don’t care if you call them silithid, they are still just big damn spiders to me. I hate them. I hate going into barrowy places where I’ll get lost … with spiders. Say what? You want me to go in that thing. You want me to do a Noxious Lair Investigation? You can keep your 50 silver buddy, I’m so not going in there. I’m sorry about the water pools but you’re going to have to find some other brave adventurer for that one. Okay, Eastern Plaguelands. THE WHOLE ZONE scared the crap out of me. I mean really, really. The first time I stumbled into it I was not the correct level and I was immediately massacred by Plaguehounds. I leveled up and went back, saw Corin’s Crossing and decided I’d skip it. Later characters spent more time there, and it’s a kinder, gentler Plaguelands now but still creeps me out. I think I have a problem with undead. Except my own undead who’s really rather nice. Were they still creepy? Well, I still can’t find my way out of a barrow. In the case of most of the other locations, while I could remember how frightening they’d been the first time through, they no longer held the same level of terror for me. The only one that still makes the hair on the back of my neck stand up was the Valley of Bones. I kept looking over my shoulder, there’s something not quite right about that place. While I was visiting these creepy places, my husband told me a story that seemed to fit in with the general theme. So if you’re a WoW purist this part isn’t for you. The firm my husband works for publishes an employee roster daily. Yes, it’s updated daily, the turnover is that high. My husband noticed someone that he’d talked to the day before was no longer listed. Working there seems to be like living in the Invasion of the Body Snatchers because if you go to the desk of the missing person there’ll always be someone there, working away as if they’d always been thus seated. I guess they’d grown the next pod person to replace her, scary place, almost as bad as Desolace. I really shouldn’t mention this one, if you’re a Tweeter this one will be too horrifying to contemplate. No cell phones allowed in the building … at all. No computers have internet access except the one that’s closely monitored in the library, muhahaha, how scary is that!